It's perfect for beginners and athletes alike. 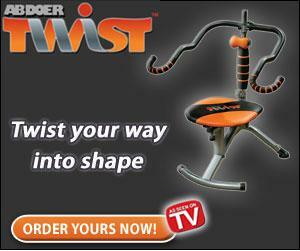 now you can transform your body and your life with the Abdoer Twist™. The abdoer abdominal workout chair is back with a whole new twist. Total workout for your midsection, abdominals, obliques and lower back. Contouring Arm Bars: eliminates stress to hands, wrists, elbows, shoulders, neck and upper back Rotate upward and downward for muscle-toning benefits to your shoulders, biceps, triceps, upper back and chest. Multiple Resistance Rods: for a more challenging core workout. Massage Roller: Gives you a revitalizing therapeutic massage every time. 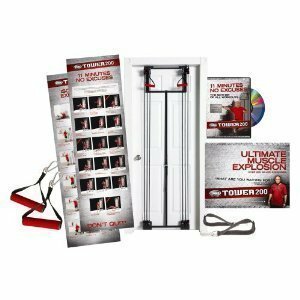 DVD Routines: Inventor and Award Winning Fitness Expert, John Abdo, guides you through several challenging and highly productive routines. The Abdoer Twist™ allows you to do "ABDOBICS", a routine that targets all sides of your midsection, including your abdominals, obliques and mid-to-lower back region. Now you can build lean muscle mass, tighten your core and aerobically scorch away calories while at the same time, multiplying your results and dramatically reducing your workout time. The new twisting action also engages your lower body to sculpt your legs, buns and thighs- all from a comfortable seated position. In just minutes a day you'll experience a total body workout in the comfort of your own home. With The Tower 200 Get Bigger, Harder and Stronger! Tower 200 uses multi-tension Power Cords. These have an advantage over free weights because as you stretch them, they become more difficult to extend. This means you are placing more stress on the muscle at exactly the right time.